In addition to the locations discussed in this section, other pages feature particular places. Migrants can be found in all the countries of the world, though some depend more than others on migrants for economic development. According to the International Migration Organization in 2010, the top three sending countries were China, India and the Philippines, with estimated diasporas of 35 million, 20 million and seven million respectively. In terms of receiving regions, Europe had the highest number of migrants, with nearly 70 million (9.5% of the population), and the US 50 million (over 14% of the population). Asia and Africa also received large numbers, but these represented less than 2% of their population in each case. Oceania’s six million migrants, however, constituted nearly 17% of its total population, whilst, in 2000, international labour migrants constituted over 60% of the population in both Qatar and the United Arab Emirates. Migration involves the movement of people between places. These might be places within the same country, as in the case of internal migration from rural environments to urban centres. They might be different, as in the case of EU or international migration. Occasionally people find themselves in a different country without having moved at all. In the 19th and 20th centuries, as national borders changed as a result of warfare, the population of Alsace was sometimes French and at other times German (Alsace is currently in France). As people move, places change. Those villages, towns and cities left behind as migrants move to new locations lose part of their labour force. Their absence may affect the local economy, not only through this loss but also as a result of money and other resources sent by migrants back to their families. Such money and resources are known as 'remittances'. They may play an important part in the development of home places. The places where migrants settle change too. Their economies benefit from a new labour source, but there may also be pressure on local services. Settlers will want to develop their own shops and businesses, social and cultural organisations, and places of worship, and these may reflect the appearance and cultural style of similar places back home. In many global cities neighbourhoods acquire names such as 'Little India', 'Chinatown', 'Bangla town' and 'Little Italy' signifying the cultural character of the area. In some cases whole towns or cities may be identified with one or more migrant or diasporic group. 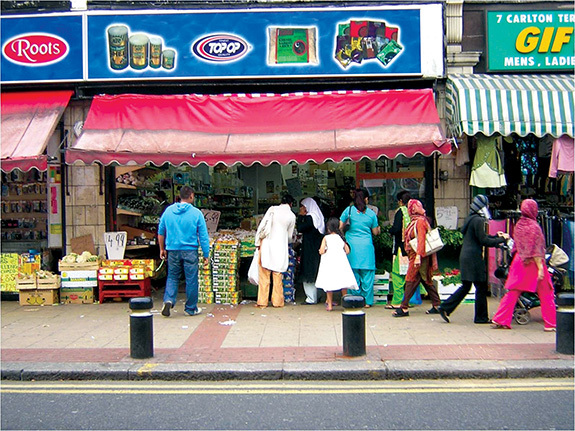 Bradford, Birmingham and Leicester, for example, are often seen as British Asian cities. 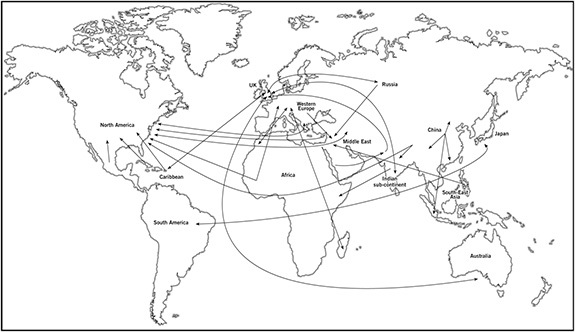 Traditions of migration between particular areas often develop leading sometimes to close geographical and business links, chains of migration (in which family members or other villagers join relatives and friends), and transnational ways of living. The concept of transnationalism refers to the practice of sustaining connections and relationships, a home and commitments to two or more countries. This may include making frequent trips, staying in touch by phone or social networking, and sending remittances. Joint citizenship may be a feature. Even if it is not, transnational migrants may feel they belong to both places. 'Home', for these migrants, may not refer to the place of origin or even the new location, but rather to family members wherever they may be living. The pages on 'Home and away' and 'Bangla mobility' describe these practices. Places may also have historical and emotional resonance for migrants. They may be recalled in memories, stories and visual and material objects, and may be visited by migrant pilgrims and tourists (see Muslim diasporas). For others, particularly those fleeing conflict, oppression or natural disasters, places may be a refuge or sanctuary, whether temporary or permanent.